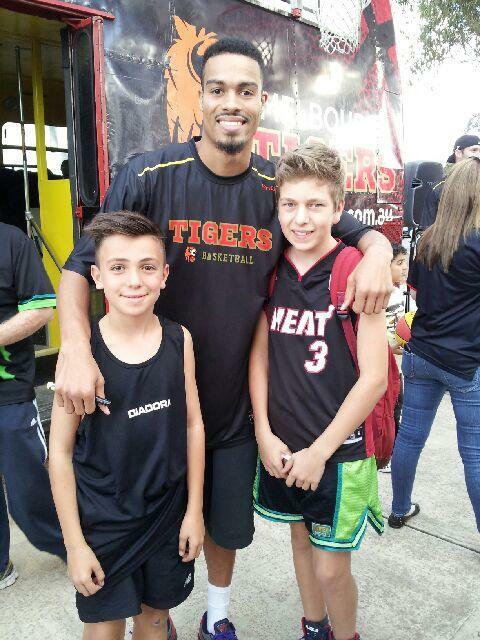 Last Tuesday the Melbourne Tigers paid a visit to our home stadium in Greenvale. 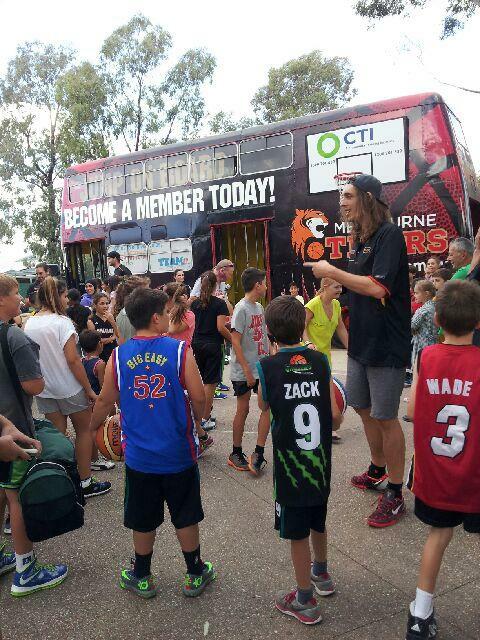 I don’t think we knew what to expect … the Tigers’ bus and lots of activities took over the car park, while skills drills were held inside. Here, we see Auryn Macmillan #42 keeping lots of Grizzlies at bay. Check out the Greenvale Gunners’ record of events – Jay Gusman and Joel Buckley with player Mustapha Farrakhan #9. 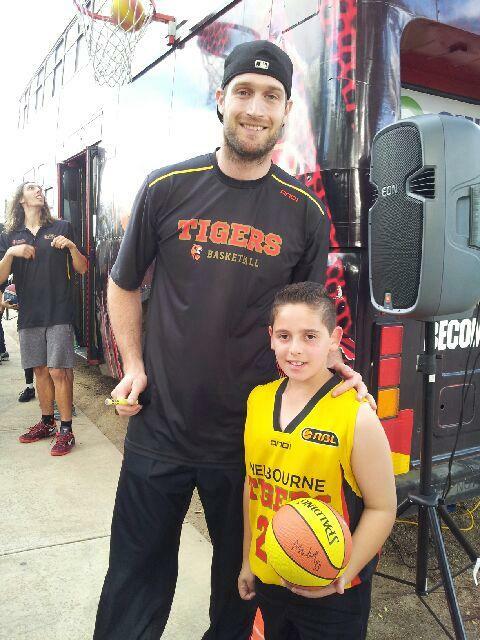 Darius Galea also a Greenvale Gunner and keen Tigers’ fan, won the boys’ hoop competition on the night. He was given a load of goodies – a very happy young lad, with Mark Worthington #33. Do you have any happy snaps you’d like to share with the club? Please email them to info@greenvalegrizzlies.org and we’ll publish them here on our website. Although they are aware we have our Presentation Day on this Sunday, the Tigers have provided our club with a further opportunity to spend more time with them. 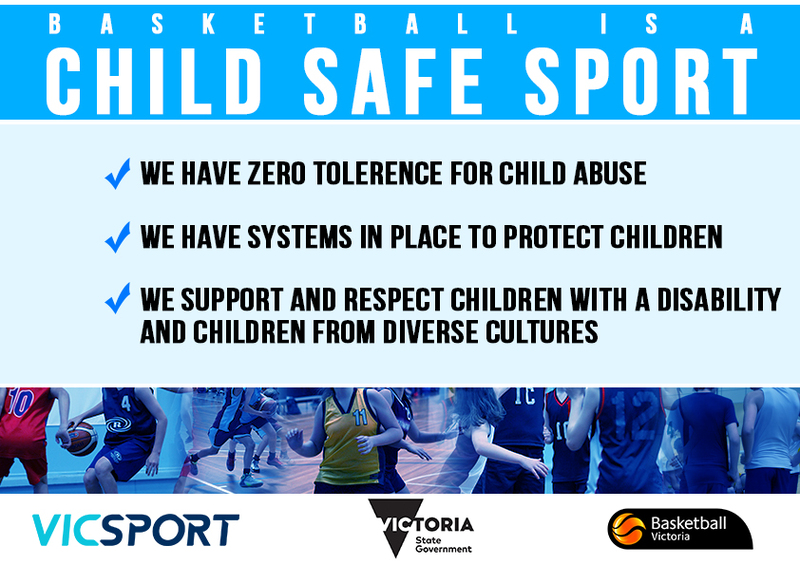 They extend an invitation to anyone that may have other family or friends not attending Presentation Day – when you buy a ticket to see the Melbourne Tigers play the NBL semi-final game against Adelaide at Hisense Arena on Sunday 30th March 2014, you will get a free child’s entry ticket. For further details, please see your Team Manager for the special offer code. This entry was posted in Events, News, Training by greenvalegrizzlies. Bookmark the permalink.